Representative Sean Scanlon with Ethan Song's parents, Mike and Kristen. State Representative Sean Scanlon joined the parents of Ethan Song, a 15-year-old Guilford teenager killed by gun violence last January, at a press conference Tuesday to announce legislation that would become known as Ethan’s Law. 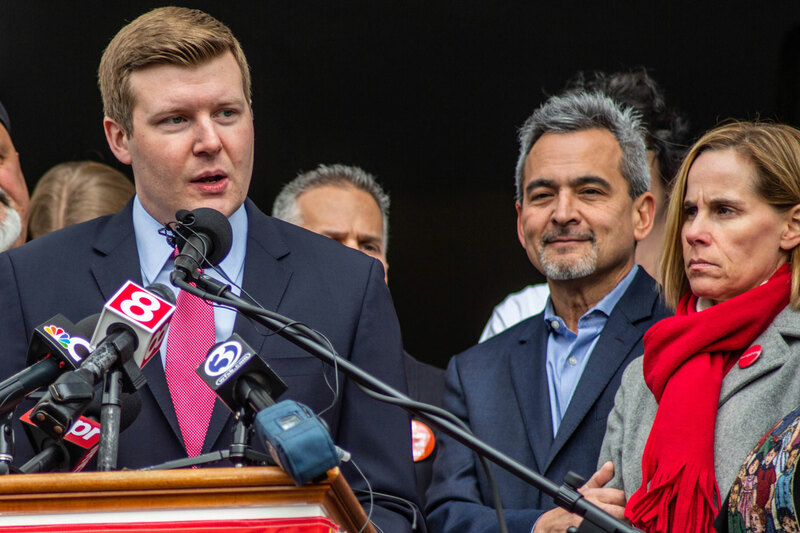 The bill, which Scanlon will introduce when the 2019 legislative session begins Jan. 9, would close a loophole in Connecticut law that prohibited prosecutors in Ethan’s killing from charging the owner of the gun used to kill him. Read this CT Mirror news story for more on the issue. “Our community suffered a great tragedy with the loss of Ethan but gun violence is a tragedy that sadly impacts each and every community in our state far too often. I am so proud to be working with Mike and Kristin on Ethan’s Law and I truly believe that by closing this loophole in his memory and the memory of other victims we will reduce gun violence and make our state safer,” Scanlon said. In a report published last week by the State’s Attorneys Office, prosecutors determined that the gun used to kill Ethan was unloaded but the gun’s bullets were stored next to the gun in the same cardboard box. Because the gun was not technically loaded despite the bullets being right next to it, the State’s Attorneys Office concluded they could not prosecute the gun’s owner based on current state statute. Ethan's Law would amend the current law to require that all firearms by properly stored and will also raise the age from 16 to 18 in which a gun owner must properly secure their firearms. “I will honor Ethan through action. I will fight for all children impacted by gun violence and work tirelessly to ensure that no other child dies because of unsecured guns and my hope is no other parent will have to walk this heartbreaking journey,” Kristen Song, Ethan’s mother, said. “Ethan’s Law will promote safe gun storage, which will reduce tragic accidents, teen suicide, school shootings and gun theft. It will save lives by motivating parents to consider the many ways that young people can access the family’s guns versus merely asking, ‘Did I unload my gun?’ ” Mike Song, Ethan’s father, said. The following is the text of the legislation. Text that is highlighted in red would be deleted from current law. The text in blue would be added. Sec. § 29-37i (Formerly Sec. 29-37c). Responsibilities re storage of [loaded] firearms. No person shall store or keep any [loaded] firearm, as defined in section 53a-3, on any premises under such person's control if such person knows or reasonably should know that (1) a minor is likely to gain access to the firearm without the permission of the parent or guardian of the minor, (2) a resident of the premises is ineligible to possess a firearm under state or federal law, or (3) a resident of the premises poses a risk of imminent personal injury to himself or herself or to other individuals, unless such person (A) keeps the firearm in a securely locked box or other container or in a location which a reasonable person would believe to be secure, or (B) carries the firearm on his or her person or within such close proximity thereto that such person can readily retrieve and use the firearm as if such person carried the firearm on his or her person. For the purposes of this section, “minor” means any person under the age of [sixteen] eighteen years. (b) Any person who violates any provision of this section shall be fine $500 and any firearm that is stored in violation of any provision of this section shall be forfeited. § 52-571g. Strict liability of person who fails to securely store a [loaded] firearm. Any person whose act or omission constitutes a violation of section 29-37i shall be strictly liable for damages when a minor or, a resident of the premises who is ineligible to possess a firearm under state or federal law or who poses a risk of imminent personal injury to himself or herself or to other individuals, obtains [a] the firearm [as defined in section 53a-3,] and causes the injury or death of such and causes the injury or death of such minor, resident or any other person. For the purposes of this section, “minor” means any person under the age of [sixteen] eighteen years. § 53a-217a. Criminally negligent storage of a firearm: Class D felony. (a) A person is guilty of criminally negligent storage of a firearm when such person violates the provisions of section 29-37i and a minor or, a resident of the premises who is ineligible to possess a firearm under state or federal law or who poses a risk of imminent personal injury to himself or herself or to other individuals, obtains the firearm and causes the injury or death of such minor, resident or any other person. For the purposes of this section, “minor” means any person under the age of [sixteen] eighteen years.